Wow that was a close game! Gonna wait until later tonight or tomorrow morning, just in case there are any final score adjustments. But holy shower. Even Badgers and Werwolves only separated by 12 points on raw scores (as I haven't added extra 10 points from Markov OOP ruck). Awesome prelims! Dont you get Grimley's ruck score? What a finish! Very unlucky boys, great game. I looked out the scores and thought Matera was the HGA for a second which would have made it a draw ahaha. Cheers Rusty, you too mate. So, the Owls got over the Hurricanes in an absolute thriller! Can't us for much more from a preliminary final if you ask me! 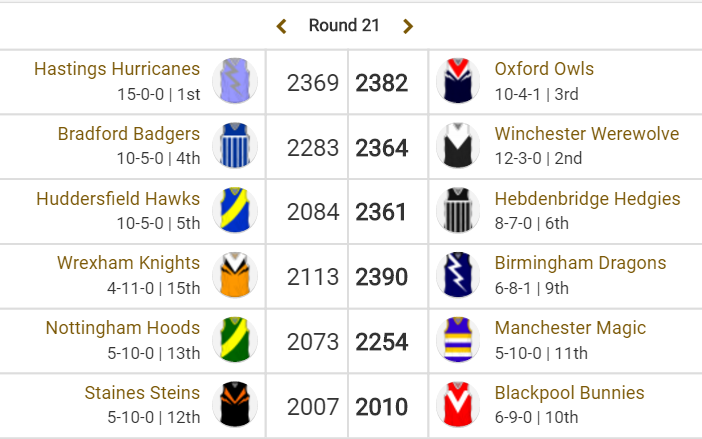 Have to feel for the 'Canes though, undefeated all year (in British, go away Purps ), and get knocked out on the final hurdle before the Grand Final by the smallest of margins. I'm sure they'll be back here again in 2017 though! In the consolation finals, we had the Dragons and Magic both winning fairly comfortably, and will face off in the minors grand final. But the big one will of course be the Grand Final clash between the Owls and the Werewolves! Going off the last few weeks, it's shaping up to be a great match!